Slartibartfast, the designer of planets in the novel the Hitchhikers Guide to the Galaxy, said he most enjoyed designing coastlines and he actually won an award for work he did designing the Norwegian fjords on planet Earth. And you can see why the Norwegian fjords may well win an intergalactic design award. These deep, narrow inlets or elongated seas are the remnants of ancient glaciers that carved huge canyons through the cliffs as they headed towards the sea. 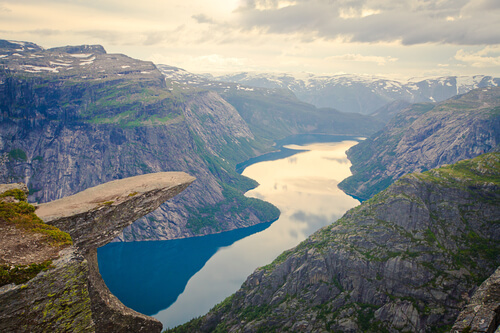 Fjords are recognised by their steep sides and forested cliffs, that fall into deep, dark pools of water that become shallower at the fjord mouth where it meets the sea. Fjords were created with the help of glaciers over several ice ages. Glaciers were first formed when water froze in cracks in the earth and over hundreds of thousands of years of freezing and melting, expanding and contracting, these cracks grew and grew. The ice sheets that sits in the valleys, can often be several kilometres thick and its immense weight slowly is pulled by gravity down towards sea level. As the glaciers melt, they wash much of the gravel and silt created by the shifting ice pack, towards the sea, causing the mouth of the fjord to be significantly shallower than further inland. Over time, what once were cracks become huge U-shaped valleys filled with billions of tones of ice, inching slowly towards the sea. Today the ice has gone but the valleys remain creating long, narrow and very deep fjords that lead out to the sea. Water doesn’t run into them in the same way it does a river or lake, but these are part of the sea, that reaches back into the land in the vast empty pools that ice from millennia ago carved out. But that does make them very tranquil, stiller than the flowing waters of a river, more sheltered than most lakes and protected from the waves of the sea by its shallow mouth. Some have become fresh water fjords as the silt deposits at the mouth of the fjord become so high that no more sea water can get in. Today, these hanging valleys with waterfalls tumbling from steep forested cliffs make for breath-taking views. 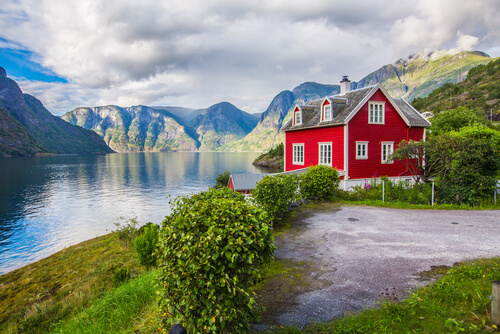 Whether it’s by boat from upon the tranquil water, from the top of the towering peaks or from the lush, low banks where sheep graze, every view the Norwegian fjords present is something that other countries only envy. The Hardangerfjord has some magical natural scenery. The beautiful waterfalls flowing down between orchards is quite spell binding. It is easy to imagine how the myths of trolls hiding in caves, behind waterfalls could have been created here. In fact, Hardangerfjord is home to a rock formation called Trolltunga - the ‘troll tongue’ – which is a major hiking location. The picturesque village of Odda, at the very end of the fjord is a great base from which to take part in some outdoor activities. The Trollfjord is the northern-most of the big fjords. 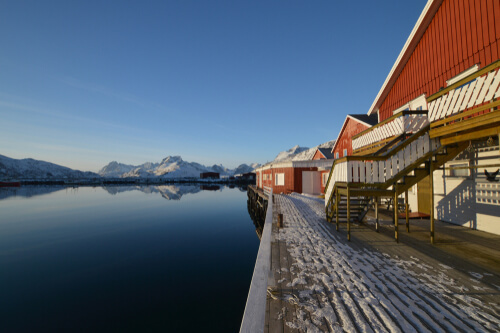 Tucked away right up in the Arctic, the fjord (named after more trolls) is nestled between the Vesterålen and Lofoten islands. Although just 2km long, it has a narrow channel that opens up into a deep bay make a visit feel like you’ve just discovered a well-kept secret. The dark-coloured rock and snow-caped peaks and the dark moody waters are in stark contrast to the lush green, welcoming fjords of the south. The Geirangerfjord is one of Norway’s most visited fjords. It passes by a number of abandoned farms and many impressive waterfalls. The most famous of which is the incredible Seven Sisters Waterfall. Directly opposite this is the Suitor Waterfall, named as it is said to be trying to catch the attention of one of the seven sisters. Having featured in a number of films this World Heritage Site is pure fjord landscape at its best. The Sognefjord is the longest and deepest fjord in Norway, extending more than 200km inland and found just north of Bergen in the heart of fjord country. At the inner most end of the Sognefjord is Jostedalsbreen, the biggest glacier in continental Europe. It is here that the highest mountains in the country combine with the deepest fjord, with green forest covering the steep cliffs making this Unesco World Heritage site one of the most beautiful sites to discover. The Nærøyfjord is much shorter, narrower and shallower than its big sister the Sognefjord but is arguably the most beautiful of the siblings. As we saw earlier, fjords are created by glaciers which are cracks in the earth’s surface and when viewed from high above look like the cracks on a pain of glass. One of the ‘arms’ that leads into the Sognefjord is the Nærøyfjord. Only 250m across and with towering cliffs either side and brightly coloured farmsteads dotted along the lush green coastline, this majestic work was certainly the one that gained Slartibartfast his award. The Lysefjord is the southern-most of Norway’s big fjords. 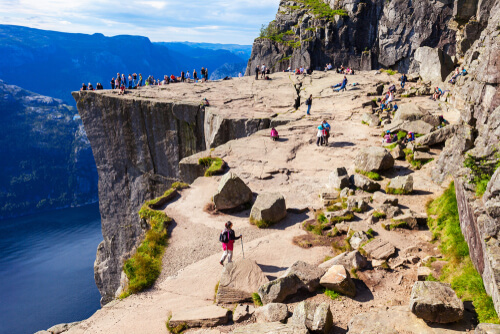 Its steep cliffs have a number of landmarks including Mount Kjerag and Pulpit Rock, where Tom Cruise was spotted, while shooting Mission Impossible 6. This is popular spot to start out on hiking trips and for the more adventurous to go climbing or kayaking from. The Oslofjord is perfect for those who don’t have the time or energy to venture further afield. The capital city of Oslo was built on it and its low banks create beaches that are packed with swimmers and picnickers in the summer months. It might not be as impressive as some of its northern neighbours, but it has a number of monasteries, fortresses and museums that provide an in depth history to the region.